I just posted a foreword to my new (still forth-coming) book. It's a book with the famous illustrator Kari Suomalainen's collected fiction, three crime short stories from the late thirties and a YA crime novel from 1948 put together. You can read it here. (In Finnish, understandably.) I liked doing the book, but it seems there are some complications with the publisher about the foreword, so we'll have to see what the outcome is. I have a longer version of the foreword, but I'm saving it for some other time. I've been pretty quiet around here for a week or so, as I've been concentrating on another blog project: the web version of my crime fiction magazine, Isku. And it's out now! You can see the first issue here. 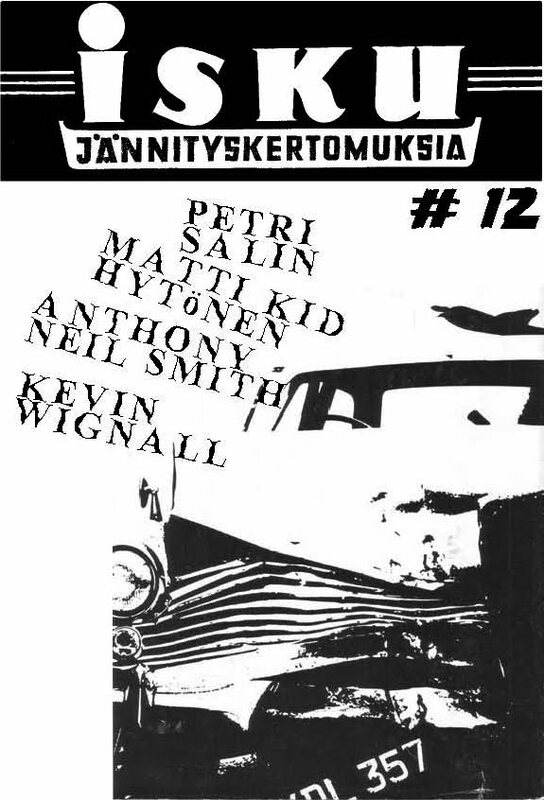 It is of course in Finnish, but I'm sure you'll recognize some of the writers: Keith Rawson, Kevin Wignall and Anthony Neil Smith. 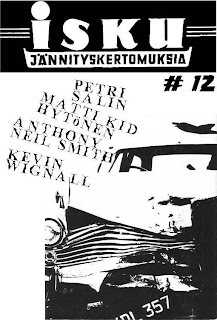 There are also two new Finnish short stories and a vintage story by Matti Kid Hytönen. It's from 1988 and was originally published in the short-lived crime fiction mag called RikosPalat (Crime Pieces, or something along those lines, in English). My friend Tapani Bagge's newest book is a little paperback called Kasvot tuulilasissa/The Face in the Windshield. It came out from Turbator (the same publishing outfit that did my Sherlock Holmes book) and carries a brilliant cover illustration by Anssi Rauhala - who also did the Holmes cover. 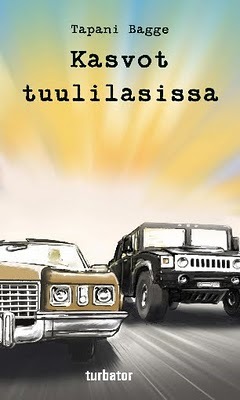 Kasvot tuulilasissa is about Onni Syrjänen, who's a lawyer down on his luck and willing to take almost any job. Hence he gets to search for a missing daughter of a known crime boss. Syrjänen finds her pretty easily, as corpses don't much walk... The book speeds on like a bullet and Syrjänen visits almost every city in Finland, in search for a missing cocaine loot. There's lots of violence and black humour and also a feel for common man, like in all the books by Tapani Bagge. I recommend this highly, if you want to spend an entertaining hour. Reading the 15,000 words (thereabout) doesn't take much longer. This is what paperbacks are supposed to be like! As a reminder: Onni Syrjänen can be read also in English, as Thrilling Detective has two stories of his escapades in translation. Check out here and here! I promised to say something about the collection of Finnish Sherlock Holmes stories I edited. The book will be out next Tuesday, with this great cover by Anssi Rauhala. I posted my short foreword and the table of contents here, on one of my other blogs, and here is also the afterword Petri Salin wrote for the book - it's about the world of Holmes pastiches. This is the first time this kind of book has been done in Finland. I don't know why, since Holmes pastiches are pretty popular in the UK and the USA. Holmes has been loved by the Finns for almost 100 years now, you'd think someone would've come up with this idea before. I got the idea when I noticed that Petri Salin, a writer of great skill and flair for old school adventure and crime, had a Holmes story in one of the issues of the Usva magazine. Then I noticed he had one even earlier in the nineties, in the science fiction magazine, Portti. And then I found two Finnish Holmes parodies in a Finnish pulp mag from the fourties, the other story being an anonymous "Sherlock Holmes in Finland" (Holmes gets lost in Finland and a Finn helps him out using his common sense) and the other being a parody by pulp writer Tuuri Heporauta (under the pseudonym of Ilkka Pilkka), with the hero's name altered into Herlock Sholmes. Then I knew I had to do this book. And I knew it would be a mix of old and new. It wasn't very hard to get people to write for this book. Almost everyone I asked was enthusiastic, and that shows. The stories I got are very good and I'm sure not many would recognize them being not written by Doyle. 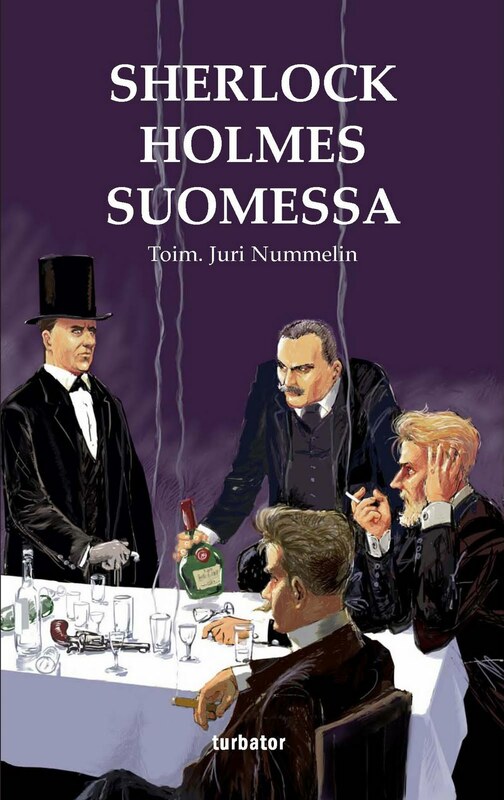 Some of the stories are of course parodies, especially the one written by Jari Tammi, in which Holmes seemingly gets spanked with a whip by two young ladies.... There's also one SF/horror story set in an alternate history, written by Anne Leinonen. Thanks to Risto Raitio I got some great old stories thrown in. And I really like the play that concludes the book: Sherlock Mopsi, written by one Arvo Salmivaara, a totally forgotten writer of plays and radio plays from the thirties and fourties. Sherlock Mopsi is very funny, and I sure hope someone will pick it up from this! I sure hope this book will find its audience. It was fun to do and I'm sure it shows! Holmes, mainly due to the Downey film, has been regaining his stature lately, and two other Finnish publishers are bringing out new Holmes books this Summer: from Teos we will have the collection of Doyle's all Holmes stories and from Bookkari will come a new edition of the Holmes stories written by Adrian Doyle and John Dickson Carr. As I mentioned earlier, I was writing an article on Margaret Millar for a forth-coming book 100 American Crime Writers (or something along those lines, I'm forgetting the exact title - or then it is just that!). I was going to do a Forgotten Friday post last Friday on two of Millar's later novels, but I never got around to doing it, so I'll post it now. Or actually I'm just copy-pasting what I wrote on the Tom Aragon books in my article. 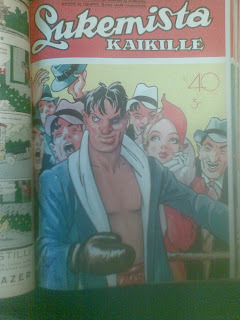 Tom Aragon was one of the few series characters Millar wrote about, and actually the only in her late career. There were couple short-lived series characters in her early books, but her mature phase (from around 1950 to the mid-sixties) hasn't any. Millar's late phase is also worthy of note, even though her books from the seventies and eighties don't rise to the level of her classics. 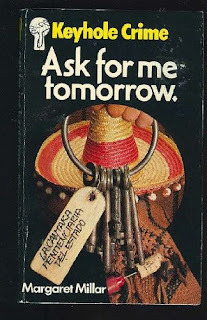 A good example is Ask For Me Tomorrow (1976) that is also one of her most traditional crime novels. The hero of the book is a young lawyer called Tom Aragon, who's called for help to search for a missing first husband. The book takes the reader on tour to Mexico, especially the poor wasteland of Baja California. Millar draws memorable characters of people living in destitude and their struggle to survive which often turns into quest for the impossible. Millar is very good at depicting Americans trying to find the American Dream, to rise from rags to riches, and their dishonesty towards themselves. Ask For Me Tomorrow is not one of Millar's best, and neither is The Murder of Miranda (1979), which also stars Tom Aragon. Both books are a bit uneasy mixtures of social satire and the private eye genre. Millar is not very good writing humorous scenes (which is paradoxical, since her earlier books were full of satire), and the books change the point of view rather clumsily. The best parts are those with Aragon, but in these scenes Millar shows the influence of her husband - they could've well been written by Ross Macdonald (which of course is a compliment). The last of the three Tom Aragon novels, Mermaid (1982), is about Aragon searching for a mildly retarted runaway girl. Do you think I'm right saying that Kenneth Millar had an influence on his wife, Margaret? I think I sensed the Ross Macdonald vibe in Ask For Me Tomorrow even when I read it in the mid-eighties, when I was 15 or 16. There are similar themes and plotlines, with the private eye figure (sure, Aragon is not a private eye, but still close and he acts like one) travelling from place to place and unravelling the mysteries of the past. 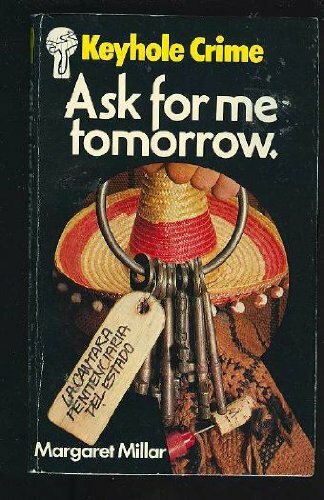 Of course Ross Macdonald had died by the time Ask For Me Tomorrow was published, but one could possibly imagine that it was based on an outline Macdonald had made. And, oh, the editor of the book 100 American Crime Writers, Steven Powell, maintains a crime-related blog here at the Venetian Vase. Take a look. Here's the cover for my newest book, an anthology I edited called Sherlock Holmes in Finland. There are fourteen short stories and one play (!) in it, a mix of new and old. The play is from 1936, called Sherlock Mopsi, from a forgotten writer called Arvo Salmivaara. It's hilarious. But I'll post more details later; the book will be out on Friday, 11st. 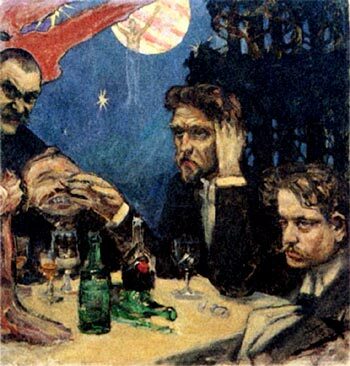 The cover (which is simply great) is by Anssi Rauhala and you can see by taking a look at this how it refers to the famous painting by the Finnish artist Axel Gallén-Kallela. I took two (well, pretty lousy) snapshots of two Finnish fiction mag covers earlier today at the university library, where I was researching stuff for a book. (Have to say I got ideas for half a dozen books.) 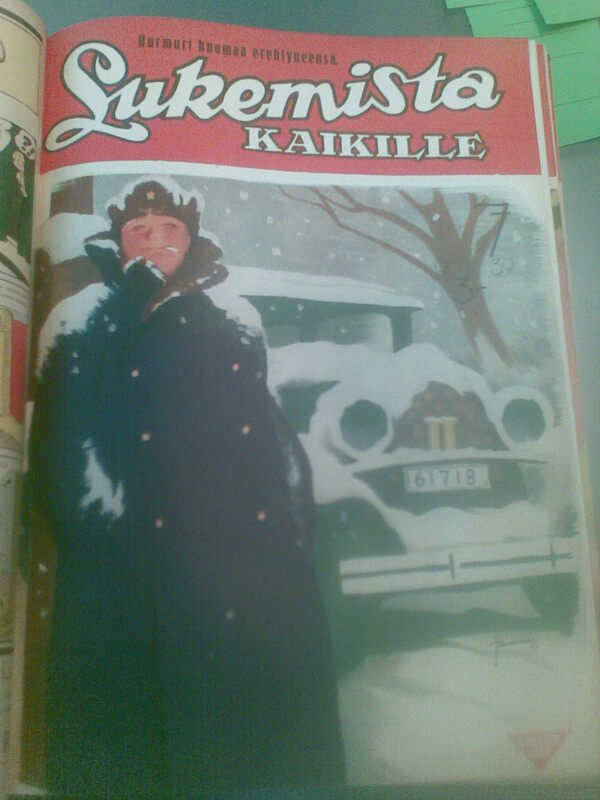 Here they are, both are from the Lukemista Kaikille/Reading For Everyone magazine that was published by Ilmarinen from the twenties to 1960. The first one is by Martti Masala, who was really versatile and talented. He did lots of illustrations for the Ilmarinen publishers, week by week, and I'm sure he burned out, since he vanished from sight in the late fourties. Not much is known about him, but his illustrations are knock-outs. The second one is by Poika Vesanto, about whom Timo Kokkila and Ville Hänninen made a good book a year ago.